The most significant changes cover two common situations where someone dies without a valid will. • A life interest (a right to income only) in half the residue. The other half of the residue passes to parents, failing them brothers and sisters and, failing them, their issue. 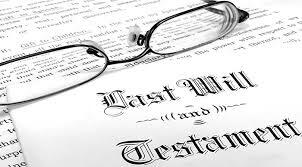 They will also receive the capital from the life interest when the surviving spouse or civil partner dies. NEW RULES: The new rules will instead pass absolutely everything to the surviving spouse/civil partner. • A life interest in half the residue. The other half of the residue passes to the child/children (under trust if under 18), with the remaining value of life interest half being paid on the surviving spouse or civil partner’s death. NEW RULES:The new rules will give the surviving spouse/civil partner half of the residue outright, rather than wrapped in a trust. The children thus lose their reversionary interest. These new rules will only apply in England and Wales; Northern Ireland and Scotland have their own intestacy rules, although history suggests Northern Ireland will soon copy the English reforms. However, as we all know, there is no excuse for not having a properly drafted and up-to-date will. We all need one. Without a valid will, your estate probably won’t be distributed in anything like the manner you would wish, and its omission may well cost your estate more in taxes.